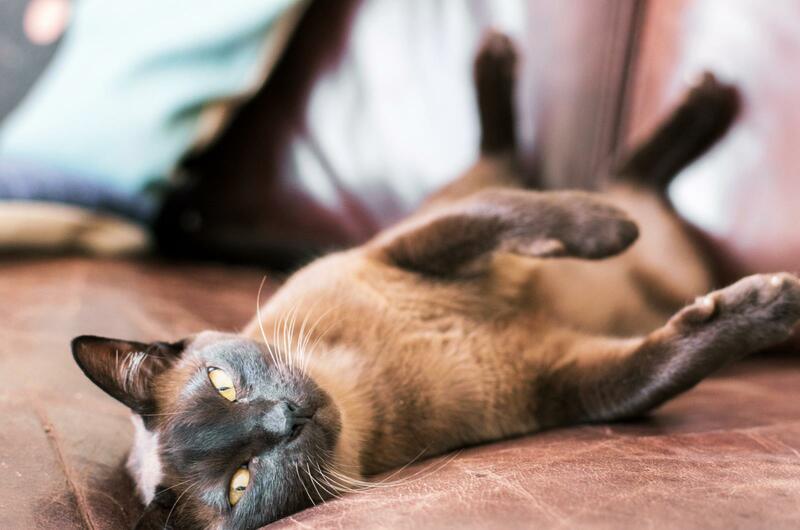 If you love the large expressive eyes of a Persian, but you don't relish the coat care involved in keeping one, Burmese cats are a lovely alternative to consider. Aside from their attractive look, this lively, affectionate breed makes a great pet for families who enjoy an outgoing, inquisitive pet. Burmese cats have a beauty all their own, epitomized by their large, rich golden eyes which peer at you from an attractively rounded head covered in deep sable fur. One look at a Burmese, and it's hard to look away. They are simply hypnotizing. According to the Cat Fanciers' Association Burmese standard are as follows. The head should have a rounded appearance no matter which angle it is viewed from. There should be a good width between the eyes, which range in color from yellow to gold. The ears are medium-sized, wide at the base and rounded at the tips. They should be set well apart on the head and tilted slightly forward. This is a medium-sized, muscular and fairly compact cat. Males are typically a little larger than females, but both sexes should have an ample chest and level back. The tail is of medium length and should be straight. 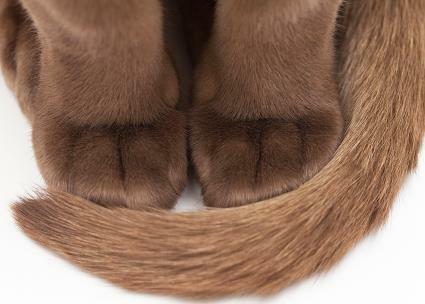 A Burmese's legs should be in proportion with the size of the body, and the paws are round with five toes on the front paws and four toes on the back paws. The coat is short and lies close to the body. It has a satin-like texture and looks glossy. They are low shedders and are actually considered a hypoallergenic cat. As lovely as Burmese cats are to look at, most owners will tell you it's the Burmese personality that keeps admirers enthralled. If you're looking for a cat that will be completely devoted to you without sacrificing its free will, look no further. Burmese are known for being extremely affectionate. They don't do well alone and will follow their humans everywhere. They're the type of cat that will always find its way onto your lap and in your bed. They also are known for enjoying time with children. These cats seem to feel it's their duty to keep their human companions entertained. It's not unheard of for some of these amazing felines to learn to play fetch, and if you're not in the mood to join in that's perfectly fine. These cats can amuse themselves and are glad to let you sit back and observe the fun. Be forewarned though, these cats can also be quite stubborn once they've set their minds on something, and you will be hard put to persuade them otherwise. They are also known to be quite vocal and will let you know how they feel at any given time. It could be considered a plus or a minus, depending on how you look at it, but Burmese are also very dependent on their owners to look after them. If they accidentally escape and become lost, these cats stand a lesser-than-average chance of surviving on their own. Burmese are definitely not the type of cat you turn outdoors for a romp around the neighborhood. Prone to diabetes which primarily affects older cats and cats who need to lose a few pounds. The disease functions the same as diabetes in people and affects the endocrine system. Flat-chested kitten syndrome which is a deformity of the chest that affects kittens and makes it difficult to breathe. In some kittens, the disorder goes away as they become adults whereas others need surgery to correct the condition. Congenital keratoconjunctivitis sicca, or dry eye disease, involves inflammation of the cornea and conjunctiva in a cat's eyes. Primary endocardial fibroelastosis is a congenital disease of the heart that strikes kittens aged 3 weeks to 4 months. Kittens with this condition rarely survive into adulthood. Meningoencephalocele, or Burmese head defect, is another congenital disease that leads to deformities on the head. Kittens with this condition are usually euthanized as they are unlikely to live very long. Most Burmese will never experience any of these issues, but it's still good to be aware of them. Burmese cats are fairly low maintenance. A regular weekly brushing is all they need as well as ear cleaning and nail trimming. 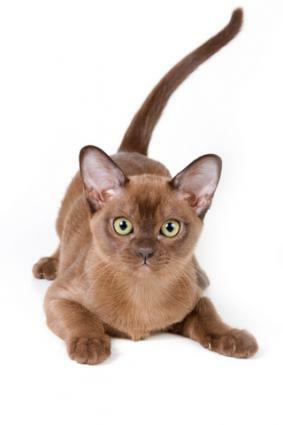 Is a Burmese Cat Right for You? Beautiful, intelligent, willful and entertaining are all words used to describe this wonderful breed of cat. If you're looking for a cat that really wants your attention, then a Burmese may fit into your life quite nicely. However, if you prefer the average feline personality that is more or less self-sufficient, preferring to bestow affection on their own terms, then Burmese cats probably aren't the breed for you. If you are seriously considering adding a Burmese to your family mix, you may want to look into the National Alliance of Burmese Breeders (NABB) rescue program. Rescued cats are usually over the age of five and often older than 10. Homes are needed all over the country, and for those interested in adopting a rescued Burmese, the NABB lists cats waiting for a new home on their website.